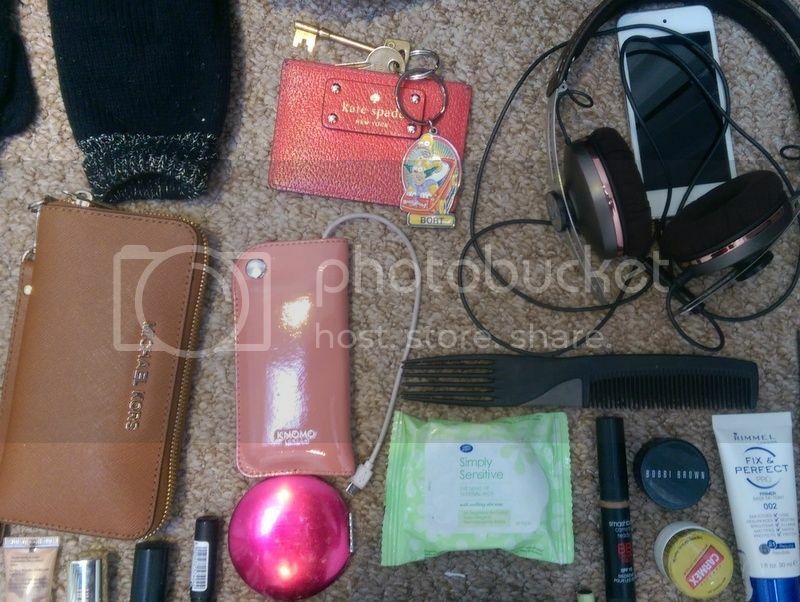 I haven't done one of these for ages, but I thought it was about time to showcase what's in my bag at the moment. I just got a new bag from JD Williams and it is the perfect size to fit everything I need. The most important things in my bag at the moment are my winter warmers: my gloves, beanie and umbrella. The umbrella is pretty useless now - one of the metal things has ripped off now a bit of the umbrella just hangs down when it's open. Apart from that, I also have a bit of make up, my wallet and my glasses which I carry around all the time. 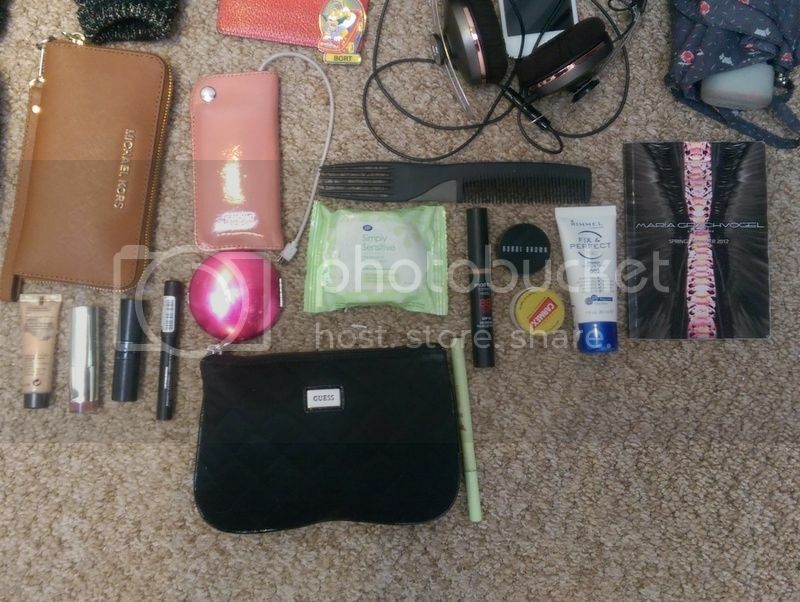 It's not that much make up I carry around with me. Some cream, concealer and lipsticks: 1 red just in case I need to glam up quickly, and 1 natural colour. And can you spot my super cool Simpsons keyring. Bonus points for anyone who gets the Bort reference. Alongside my Kate Spade card holder - I absolutely love this thing. There's also my Knomo phone charger. This one is amazing and stays charged for ages - perfect for when I'm out and my phone dies. My iPod and Sennheiser headphones are also necessities in my life. I can't leave without them at all! There's also my Kindle which I forgot to photograph. It's another thing I never leave the house without. I'm reading 'All The Light Cannot See' at the moment and it's amazing. I'm almost looking forward to my journey's into work just so I can read more of the book. Such a cute bag, Sherin! 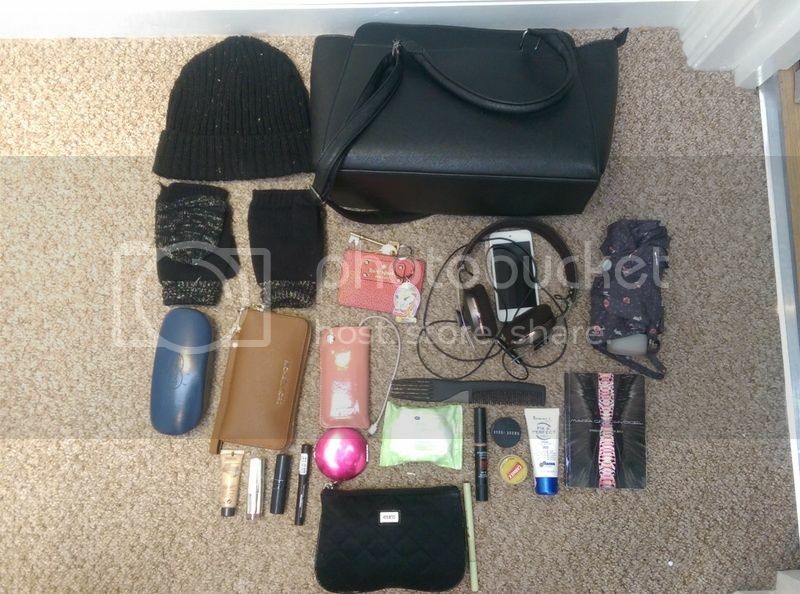 I always carry big bags, but I hate weighing them down with loads of stuff so I try to stick to essentials: makeup, wallet, phone, keys, and, of course, a book! That's truly the sign of a good book - that you're looking forward to travelling to work just to read more! My bag contents changes from day to day as I seem to constantly be changing bags but I can never leave home with my phone and a lipstick or two. Lots of cool gear! I need to carry a charger in my bag - great idea!